Based upon its commitment to ensuring more Hoosiers can afford to pursue their higher education aspirations, Indiana State University is scaling back a planned tuition increase for next year. The university's board of trustees today approved a recommendation from President Daniel Bradley and Trustee President Mike Alley to reduce a scheduled 3.5 percent increase in in-state undergraduate student fees to 1.5 percent. The action is a first step in supporting the implementation of Bradley's announcement last week that Indiana State would seek to limit future increases in student costs to increases in the Consumer Price Index. "With affordability foremost on the minds of many of our students and families, we are responding by rolling back a planned tuition increase for fall 2012," Bradley said. "For a new, full-time student, this rollback will represent a savings of nearly $650 over four years." In his October 5 Fall Address, Bradley announced plans to appoint a campus task force to examine affordability across all areas of the university. Specifically, the task force will look at facilities and space utilization, instructional costs, housing and dining, and books and supplies. The chairs of the various committees that will make up the task force will be announced next week and that work will begin in earnest before the end of October, Bradley said. He asked that the task force deliver recommendations by the beginning of 2012. "We recognize the economic challenges today's high costs pose for Hoosier families. This action is needed to ensure that more Hoosiers will complete a four-year degree that will help them and the State of Indiana compete in a global economy," Bradley said. "It won't be easy, but I am confident that by working together as a campus and in partnership with our state's leaders, we can meet the affordability challenge while remaining committed to the goals set out in our strategic plan." Alley said the move will help address the state's goal of improving the educational level of Indiana's workforce. "ISU is uniquely positioned to dramatically impact the proportion of Hoosiers who earn a four-year degree. Accessibility and affordability are key factors in realizing this success and the Board of Trustees is committed to increasing accessibility and maintaining affordability," he said. Today's action means undergraduate student fees at Indiana State will be $3,949 per semester for Indiana residents during the 2012-13 academic year, a savings of $81 per semester ($162 per academic year) from the previously approved rates, or a savings of $648 over four years. Also Friday, trustees authorized the university administration to seek state approval for the renovation of Erickson Hall to return the building to its original purpose as a residence hall. Cost of the project is not to exceed $10 million. Trustees heard a report from the President's Council on Diversity that noted Indiana State had increased its ranks of African-American faculty members by 50 percent during the past year. Minorities represented 25 percent of all faculty hiring and about two-thirds of faculty hires were women. Key pieces of the university's diversifying faculty initiative were an "opportunity hires" program that focused on under-represented populations and a scholar collaboration day that attracted 20 prospective faculty members, said Joshua Powers, special assistant to the provost and co-chair of the Diversity Council. "That experience was important for re-framing the search process by focusing on collaborative elements and interaction with the community rather than competing for a job," Powers said. 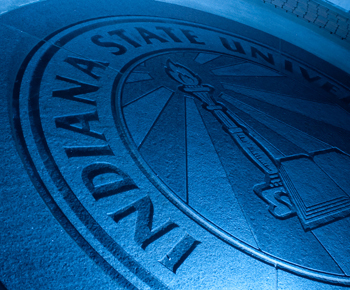 "That event affirmed that Indiana State can be an employer of choice for historically under-represented faculty, but it requires a different way of thinking about the search process." The council recommended continuing the "opportunity hires" program again this year and proposed an outreach to high-achieving African-American high school students to attend Indiana State and serve as academic anchors to build what Powers called "models of success" for other African-American students. The complete report is available on the Diversity Council's website at www.indstate.edu/diversitycouncil/. • Approved academic calendars for 2012-13 and 2013-14 that provide for classes to begin in August one day earlier than in the past and replacing a one-day fall break in October with a week-long break at Thanksgiving. ISU is scaling back a planned tuition increase for next year, reducing a scheduled 3.5 percent increase in student fees for in-state undergraduates to 1.5 percent.